The Success of BPM Fridays @ Island & the Legendary Posh... The promoters of both venues have come together to create a party @ Area Ultra Lounge with the likes of Metropolis!!! 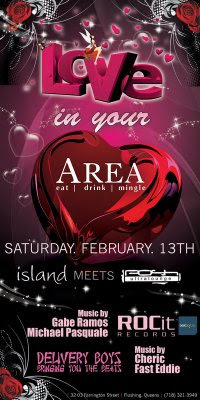 This week @ Area... We Bring you the "Love" Party!!! Groups of 5 Girls or more Receive a Complimentary Bottle of Champagne w. ADVANCED RESERVATIONS!!! Free Admission Before Midnight for Gentlemen & Free Admission for the Ladies ALL NIGHT!!! w. the Newest, Biggest, Loudest Club to hit Queens in Yrs!!! THE HOTTEST STAFF some from POSH!!! Many thx for my dear friend Sandy Ferrante for the invitation.